Somehow my skills at tossing a little foam basketball through a hoop clipped to the top of my bedroom door didn’t translate to the real thing. It turns out real basketballs are much larger and heavier. My masterful technique of pinching the ball with my index finger and thumb and then flipping it across the room was useless. It’s like I had to learn a whole new game from scratch! Today’s Maximumble is having a romantic dinner. 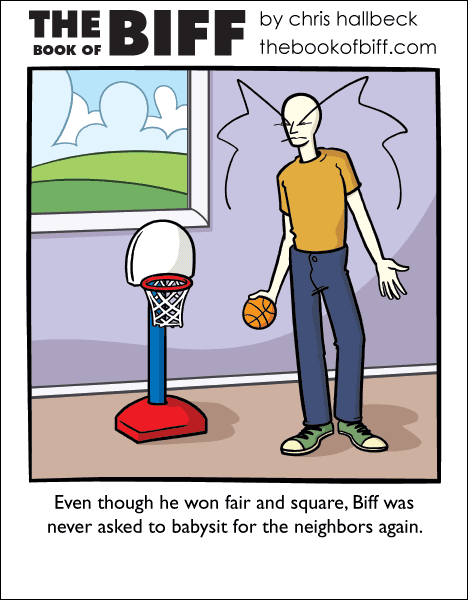 I love the mental image of the off-screen children crying while Biff just keeps going, “what?” in a demanding voice. Ahhh… You’ve made me think of those arcades where you play games and win tickets. I have really good reflexes, so one of those “stop the light at this specific place” or “stop on exactly 1000” machines I used to win so many tickets… Then the staff kicked me out, but I still had the tickets, so I came back the next day and used them. I did love those arcades. And how does this make me think of them? The mini basketball hoops, of course. I tried those once. “Today’s Biff is on the rebound.” is just terrible, and I love you for it. I could only make mid-court shots. From anywhere else was a sure miss. Once the other kids figured that out, I got double guarded at mid-court and left alone everywhere else. So my basketball career never took off. Now if we had those little plastic hoops, I could have taken up dunkin it. I wasn’t so bad at the shooting – free throw, 3 point, layup, and so on. It was everything *else* – the defending, the zoning, the hustling, the exhausting – that left me behind. I mean, c’mon, though! Why should I have to be *athletic* to be an athlete?